Visitors at the event will be treated to music, interactive games and prizes, educational displays, a bicycle giveaway, a children’s coloring activity as well as a number of exhibits of hybrid and low emissions vehicles provided by local dealerships. BAR representatives will also be on site to demonstrate simple vehicle maintenance tips, such as how to check tire pressure. These activities can help consumers extend the life of their vehicles as well as save money at the gas pump. Vehicle emissions contribute to several thousand tons of pollution per day in California and 50 percent of this pollution is produced by only 10 to 15 percent of the vehicles on our roads. BAR, a division of the California Department of Consumer Affairs, is one of the state’s air quality champions. BAR is responsible for administering California’s Smog Check Program, which removes several tons of pollutants from our air. 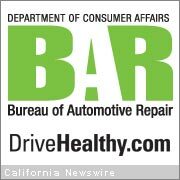 BAR also licenses and regulates more than 35,000 automotive repair dealers and 7,500 Smog Check stations in California. It also administers the Consumer Assistance Program, which offers consumers who own a vehicle that fails its biennial (every other year) Smog Check inspection up to $500 for emissions-related repairs or $1,000 to retire their vehicle. DriveHealthy, a California Bureau of Automotive Repair clean air initiative, aims to reduce air pollutants in California through vehicle maintenance education. For additional maintenance tips, or for more details about the DriveHealthy campaign, please visit www.DriveHealthy.com. For further information about the Smog Check program, or to obtain information about retiring polluting vehicles or receiving state financial aid to repair vehicles that have failed Smog Check, call 1-800-952-5210 or visit www.smogcheck.ca.gov. Help is available in more than 170 languages, including Spanish, Vietnamese, Cantonese, Hmong, Tagalog and Russian.